This past Friday I went to "Friday Night Fran" at Crossfit Craic. I signed up early in the week, so I knew I would be doing this. Thursday night was tough - I could not sleep for having weird dreams about struggling with the weight or the pull-ups or falling or running out of time, etc. Luckily, this workout was awesome. The whole night was a combination of a one event Garage Games and a party with good friends. The workout was broken into 10-minute heats. I was in the third heat and, as planned, had 75# on the bar. Katie was my judge and counter (worrisome only because I had no-repped her a couple times during her workout). I got through the first 21 thrusters according to my plan (7-7-7) and slowed down on pull ups. 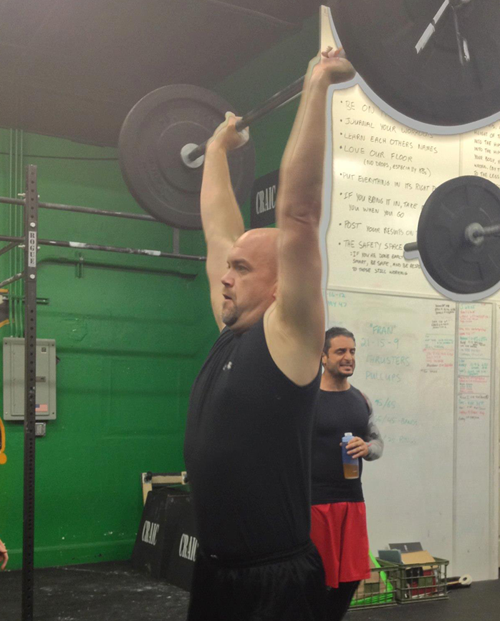 15 more thrusters were tough, and the pull ups even harder. Coach Pete came over and got in my ear to keep me moving. As I started the nines, I knew I must be one of the last competitors left and was running out of time. Pete and Katie kept on me to get through the 9 thrusters (3-2-1-3) and 9 pullups (2-1-1-1-1-1-1-1). I looked up at the clock. 9:48. Awesome! I will take this opportunity to thank Nicole at Crossfit 2A, too. Thanks to her, I got plenty of practice with thrusters, squats, and presses - mostly with 85+ on the bar. Definitely made 75# thrusters tolerable. The new plan is to start practicing at 115# to get to RX @ 95#.